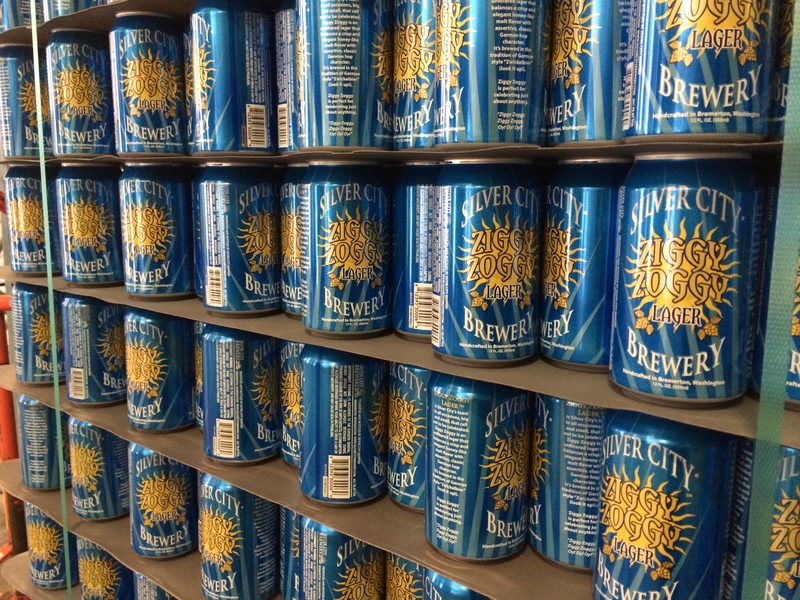 I have been a big fan of Silver City Brewing Co. for quite some time and always look forward to anything new. Recently I had the privilege to hang out with the guys at Silver City’s tap-room and sample some of the new seasonals and specialties on tap. I got to relax with the brewery’s owner, Scott, and with the brewers themselves enjoying some tasty seasonals currently on tap. A game or two of “Ziggy Zoggy Foursquare” took place, and fun was had by all! So let’s get to it! Huckleberry Wheat (5.4% ABV) – Subtle fruit from throughout. Crisp, clean, with a soft fruit finish. Lightly hopped. Very nice. Sour POWr Pear Lambic (6.2%ABV) – Gorgeous golden color. Pears are aged in the beer for a year creating a wonderful fruit sourness. Light honey top notes with a nice sour finish. West Sound IPA (5.2%ABV) – For those who like a lighter hopped IPA, be careful! This beer is deceiving. The aroma is hoppy but soft. The first sip is mild but then suddenly, POW! The hops just punch you right in the face. Big citrus finish. Perfect for the IPA lover. Rye Bock (6.5%ABV) – Sweet and hazel nutty. Rye character carries all the way through. Malty, sweet finish. Medium to full body. Deluxe Spring Lager (6.2%ABV) – Once of my favorites of the day! Very nice with honey, floral character. Light, not too sweet. Reminds me of Golden Grahams cereal. Nice sweet finish. Perfect for spring or an early, mild summer day. Happy Fun Time Ginger Beer (4%ABV) – I’m usually not a fan of ginger beer. Most brewers tend to overdo the ginger producing a much too tangy product. But this ginger beer is a delight! Big ginger aroma and nice ginger flavor throughout. Well-balanced and refreshing. The ginger is just right, not too overpowering. B-Town Sour Red (6.3%ABV) – Sweet-tart candy sour. Slight hard-alcohol aroma. definitely a sipper. Rye Whiskey Barrel Aged ImperiaI Red (8.5%ABV) – Thick, syrupy body. High alcohol aroma. Sweet, nutty first note. Finishes strong. Be careful! Golden Mountain Pilsner (5%ABV) – Sweet, bubbly, effervescent. Honey notes, finishes crisp. Light and well, balanced. The Silver City Flagship Restaurant is located at 2799 NW Myhre Road in Silverdale at the Silverdale Mall. The Brewery & Tap Room is located in Bremerton at 206 Katy Penman Drive. The tap-room does not serve food but you are welcome to bring in anything you wish to munch on. Many of their beers are available in bottles at your local market or bottle shop. If you haven’t stopped by one of these locations in person then all I have to ask is, where the heck have you been?